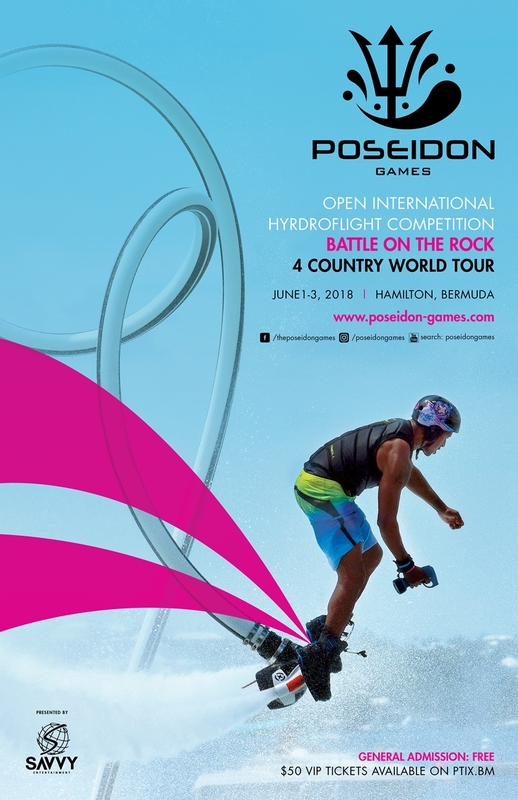 Savvy Entertainment announced that Bermuda is set to host the Poseidon Games from June 1-3, 2018, with 32 of the world’s top hydroflight athletes set for the second leg of the world tour. Savvy COO Danilee Trott said, “Back in August 2017, Savvy Entertainment introduced the island to the world of Hydroflight competition with Battle on the Rock. Since then, we have developed Poseidon Games and have had a successful inaugural event in Australia. Savvy CEO Anthony Blakey said, ““Savvy Entertainment is excited about the immediate growth in the industry and impact that Poseidon Games has introduced. “Our vision for the brand is to continue to expand into other countries and incorporate additional water sports, creating a watersports competition circuit comparable to X Games. Savvy said, “Poseidon Games is free to attend and can be viewed from the event village located in No 1 Car Park Front Street Hamilton. In addition, we encourage the boating community to join us and watch the competition from the water in Hamilton Harbour. “Those seeking a more exclusive Poseidon Games experience can purchase tickets to the Poseidon Games VIP section on ptix.bm.